Is “eloquence” harmful, or beneficial, to states and individuals? 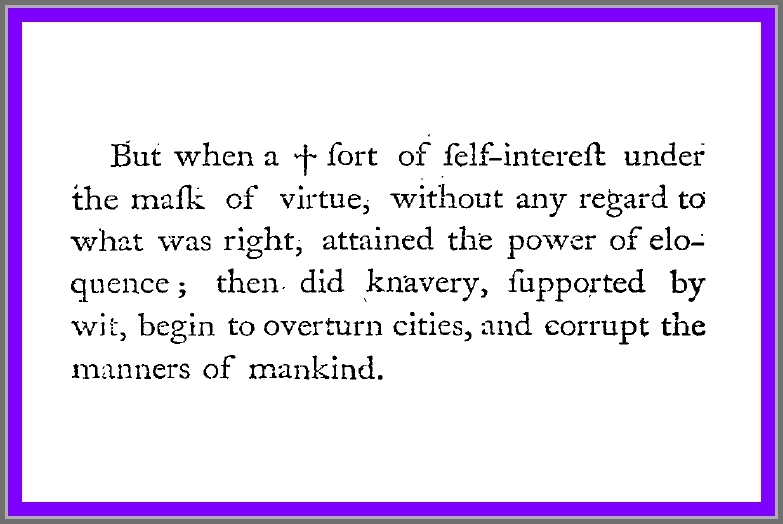 This was the question debated in the “preface” to Cicero’s work, De Inventione (On Invention) translated into English in 1745. I’ve provided the 1745 translation in full, below, including the original spelling and grammar (with minor corrections). » » » It has been a subject that I have often and much thought upon, whether eloquence in its highest perfection, has been the source of more good or mischief to men and to states. » » » For when I consider our own misfortunes, and recollect the calamities of old in the greatest republicks, I am convinced that no small inconveniences have been introduced by men of the first eloquence. constituted, many wars put an end to, and the firmest alliances and strictest friendships cemented, not only by reason and good sense, but more easily by eloquence. » » » My own reason at last leads me to this determination, that wisdom without eloquence can be of little use to states; but eloquence without wisdom may frequently hurt them, and can never be of service to them. » » » Wherefore if any one, regardless of the most upright and generous studies of reason and his duty, shall waste all his abilities in the practice of speaking; I call that man useless to himself, and pernicious to his community. » » » But he who arms himself with eloquence, with a view never to oppose his country’s good, but to be able to make a stand for it; seems to me to be a man most conducive to his own and the publick welfare, and a true friend to his country. or an art, the effect of practice, or the gift of nature; we shall find, that it owes its original to the most exalted principles, and its improvement to the most rational pursuits. » » » For there was a time when men, after the manner of the brute-kind, wandered at large about the fields, and sustained their lives by theiri prey upon wild beasts. » » » The rational faculties had then no share in their actions, but the strength of the body chiefly administered to their wants. » » » The duties of religion and humanity were not yet cultivated: none knew the happiness of lawful marriage: no father could look upon his children as his own; nor had yet experienced the advantages that proceed from equitable laws. » » » Thus through error and ignorance, the will, (that blind and headstrong tyrant of the mind) abused the powers of the body (pernicious ministers!) to its own gratification. qualifications, and how great, were latently planted in the mind of man for the noblest ends, if they could be struck out into light, and improved by precept. » » » His superior genius collected them into one place, from their wandering way of life, and their wild habitations in the woods; and prompting them to whatever was useful and honourable, though at first refractory for want of use, yet soon charmed with still attention by his wisdom and eloquence, he broke their brutal fierceness into gentleness and humanity. » » » And indeed to me it seems, that silent and speechless wisdom, could never have had the influence to make such a sudden reformation in mankind from their bad habits, and gain them over to the various duties of a rational life. I say, how could all this be brought about, without the aid of persuasive eloquence to inculcate the discoveries of reason? » » » None surely; who by his strength could do mighty things; unless won by solid and sweet persuasion, would, without the interposition of force, have subjected himself to the restraint of laws: put himself upon a level with those to whom his strength made him superior, and willingly forsaken his beloved passions, to which habit had almost given the force of nature. » » » This was the rise, this the progress of eloquence, which afterwards had much to do in the conduct of the greatest affairs, to the singular advantage of mankind. » » » But when a sort of self-interest, under the mask of virtue, without any regard to what was right, attained the power of eloquence; then did knavery, supported by wit, begin to overturn cities, and corrupt the manners of mankind. » » » Let us likewise explain the source of this mischievous effect, as we did of the other good one. » » » It seems to be very probable, that there was a time when minors and men of low genius were not admitted to the publick affairs; nor did great and eloquent men interfere in private causes. » » » But whilst the most important matters were conducted by the greatest men; others who did not want cunning, apply’d themselves to minuter controversies of private persons. » » » In which controversies, falshood often prevailing against truth, the continual practice of speaking gave growth to impudence; so those great men were necessarily obliged, by the injuries of their fellow citizens, to resist these daring fellows, and every of them to take his respective friends into his protection. » » » When therefore he, who regardless of wisdom made eloquence his only study, was often equal in speaking, sometimes superior, it happened, that in the opinion of the many, and his own conceit, he seemed a person worthy to govern the common-wealth. » » » Hence it was, and not without reason, that when rash and audacious men were intrusted with the helm of government, great and miserable shipwreck ensued. » » » By this means eloquence contracted so much hatred and envy, that the most ingenious men, made their retreat from this seditious and tumultuous way of life, to some quiet study, as it were out of a turbulent storm into a quiet haven. » » » Whence afterwards, as I presume, other virtuous and generous arts being cultivated by great men in their retirements, shone forth; and eloquence being deserted by most, grew out of fashion, at a time when it ought to have been more strenuously retained, and more industriously improved. » » » For by how much the more the rashness and boldness of fools and profligates, shamefully trampled upon this most honourable and virtuous art, to the great hurt of the community; so much the more strenuous, should have been the resistance and struggle for the publick-weal. » » » Of which our own Cato was not insensible, nor Laelius, nor Africanus, who was indeed their disciple, nor the Gracchi, the grandsons of Africanus; men distinguished by the noblest virtues, and a dignity enlarged by the noblest virtues, with eloquence to adorn these advantages, and defend their country. » » » Wherefore, in my opinion, it ought to be no discouragement to the study of eloquence, because it is perversely abused both in publick and private life; but rather a stronger inducement to the more vigorous prosecution of it, lest ill men should have it in their power to run their full lengths, to the great annoyance of the good, and the common ruin of all. » » » Especially as this is the only art that concerns every part of life, both publick and private; by this life is render’d safe, by this honourable, by this illustrious, by this likewise it becomes pleasant. orators themselves, applause, honour, dignity; to their friends a sure and safe patronage and protection. » » » To me it seems, that though mankind are inferior and more defective than brutes in many respects; yet their chief pre-eminence is, that they have the power of speech. » » » Wherefore, I esteem it a most honourable attainment, to excell the rest of mankind in that, wherein mankind excell brutes. 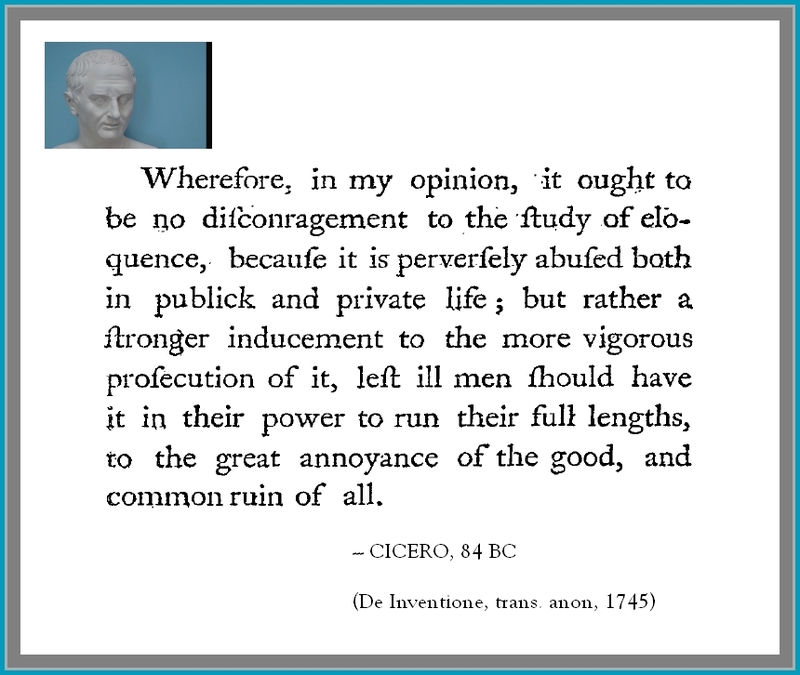 Cicero, M. T. (1745). The oration of Marcus Tullius Cicero, for Marcus Marcellus, address’d to Caius Julius Cæsar, dictator, and the Roman Senate; being a specimen of a translation of Tully’s select orations. 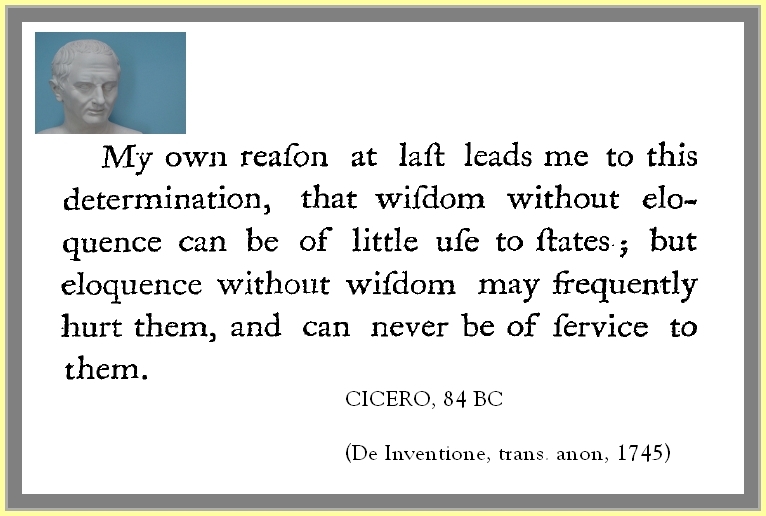 To which is prefix’d Cicero’s preface to his first book of invention, translated into English. Being a Dissertaion on the Rise, Progress, and Decay of Eloquence. 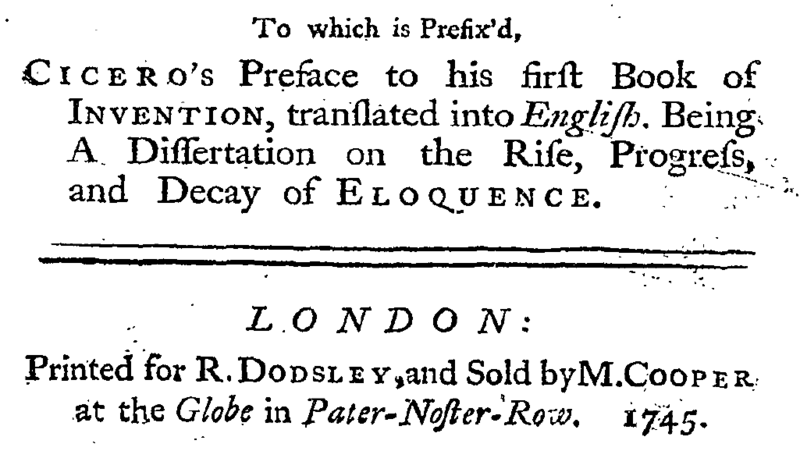 London: printed for R. Dodsley, and sold by M. Cooper at the Globe in Pater-Noster-Row. Note: Page numbering reflects the fact that the text was presented with alternate pages in Latin, then English. The English pages were numbered 9, 11, 13, etc. A summary of Seneca’s ideas was published in English by Sir Roger L’Estrange in 1678. The volume included a rearrangement and summary of Seneca’s books On Benefits, On The Happy Life, On Anger, and On Clemency, as well as Seneca’s 124 epistles to Lucilius. This work went through 37 printings from its first edition to 1799. The height of its popularity was in the 1760s, when in 1764 one of the five editions included several illustrations. The first four of L’Estrange’s 28 “epistles” collected Seneca’s ideas on rhetorical delivery and style. Eloquence, depicted by a Roman soldier in armor and cape holding fire in his right hand and an hourglass in his left hand, atop an open book. From “Seneca’s Morals by Way of Abstract,” trans. L’Estrange, 1764. EPIST. I.Certain general Directions for the Government of the Voice; as in speaking soft, or loud; quick, or slow: The Speech is the Index of the Mind. YOU say well, that in speaking, the very Ordering of the Voice, (to say nothing of the Actions, Countenances, and other Circumstances that accompany it) is a Consideration worthy of a Wise Man. There are that prescribe Certain Modes of Rising, and Falling: Nay, if you will be govern’d by them, you shall not speak a word, move a step, or eat a Bit, but by a Rule: And these perhaps are too critical. 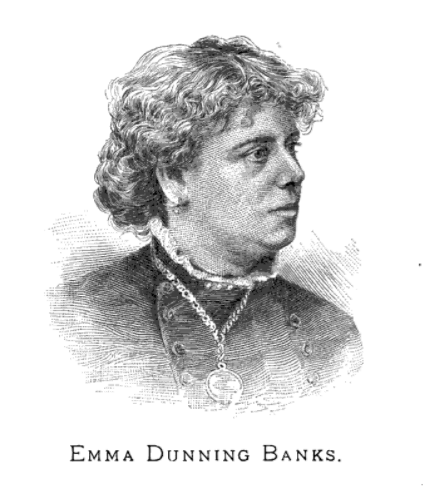 Do not understand me yet, as if I made no Difference betwixt entering upon a Discourse loud, or soft; for the Affections do naturally rise by Degrees; and, in all Disputes, or Pleadings, whether publick, or private, a Man should properly begin with Modesty, and Temper, and so advance by little and little, if need be, into Clamor, and Vociferation. And as the Voice rises by Degrees, let it fall so too; not snapping off upon a sudden, but abating, as upon Moderation: The other is unmannerly, and rude. He that has a precipitate Speech, is commonly violent in his Manners: Beside, that there is in it much of Vanity, and Emptiness; and no Man takes Satisfaction in a Flux of Words, without Choice; where the Noise is more than the Value. Fabius was a Man eminent, both for his Life, and Learning; and no less for his Eloquence. His Speech was rather easy and sliding, than quick; which he accounted to be not only liable to many Errors, but to a Suspicion of Immodesty. Nay, let a Man have Words never so much at will, he will no more speak fast, than he will run; for fear his Tongue should go before his Wit. The Speech of a Philosopher should be like his Life, composed, without Pressing, or Stumbling; which is fitter for a Mountebank, than a Man of Sobriety, and Business. And then to drop one Word after another, he is as bad on the other Side. The Interruption is tedious, and tires out the Auditor with Expectation. Truth and Morality should be delivered in Words plain, and without Affectation; for, like Remedies, unless they stay with us, we are never the better for them. He that would work upon his Hearers, must no more expect to do it upon the Post, than a Physician to cure his Patients, only in passing by them. Not but that I would have a wise Man, in some Cases, to raise himself, and mend his Pace; but still with a regard to the Dignity of his Manners; though there may be a great Force also in Moderation. I would have his Discourse smooth, and flowing like a River; not Impetuous, like a Torrent. There is a rapid, lawless, and irrevocable Velocity of Speech, which I would scarce allow, even to an Orator; for if he be transported with Passion, or Ostentation, a Man’s Attention can hardly keep him Company. It is not the Quantity, but the Pertinence, that does the Business. Let the Words of an ancient Man flow soft, and gentle; [*] but not run on without Fear, or Wit, as if a whole Declamation were to be but one Period. Cicero wrote with Care, and that which will for ever stand the Test. All publick Languages are according to the Humor of the Age. A Wantonness, and Effeminacy of Speech, denotes Luxury; for the Wit follows the Mind: If the latter be sound, composed, temperate, and grave; the Wit is dry, and sober too: but if the one be corrupted, the other is likewise unsound. Do we not see, when a Man’s Mind is heavy, how he creeps, and draws his Legs after him? A finical Temper is read in the very Gesture and Cloaths; if a Man be choleric and violent, it is also discovered in his Motions. An angry Man speaks short, and quick; the Speech of an effeminate Man is loose and melting. A quaint and solicitous way of Speaking, is the Sign of a weak Mind; but a great Man speaks with Ease, and Freedom; and with more Assurance, though less care. Speech is the Index of the Mind: When you see a Man dress, and set his Clothes in Print, you shall be sure to find his Words so too, and nothing in them that is firm and weighty: It does not become a Man to be delicate. As it is in Drink, the Tongue never trips, until the Mind be over-born; So it is with Speech, so long as the Mind is whole and sound, the Speech is masculine and strong; but, if one fails, the other follows. Seneca, L. A. (1764). Seneca’s morals by way of abstract. To which is added, a discourse under the title of an after-thought. Adorned with cuts. By Sir Roger L’Estrange, knt. (R. L’Estrange, Trans.). London: Printed for J. and R. Tonson, A. Millar, E. Ballard, W. Strahan, J. Rivington, R. Baldwin, L. Hawes, W. Clark and R. Collins, W. Johnston, and C. and R. Ware.